I am sorry to be posting the day’s news so late. We finished the display and sales table just in time for Preview evening at 6pm and were then rushed off our feet right through to the 9pm close. 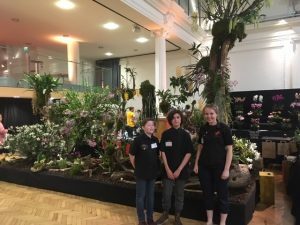 Here is a photo of Joe, Otto and Zoe at the end of their 17hour working day (we left the greenhouse at 4am) with what could be our best ever London Show Display behind them. More details of the display will follow tomorrow when the light is better for photographs. Preview started with the visit by of a delegation from Kuching (Sarawak), including the Mayor, Director and Deputy Director of the Development and Landscape Department who are keen to publicise APOC (Asian Pacific Orchid Congress) coming to Kuching in July, as well as learn more about the work of the Writhlington School Orchid Project before our visit to work with the MRSM School in Kuching. Our visitors were particularly interested in our propagation laboratory, and enjoyed re-plating their own seedlings in the laminar flow cabinet with expert instruction from Otto and Joe. 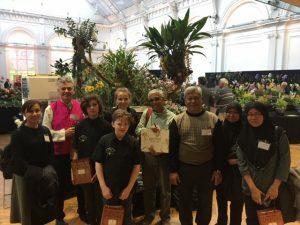 Great to see the educational network extending and the opportunities for WSBEorchids increasing.